You can transfer files yourself if you’re moving from a Windows 7, 8, 8.1, or 10 PC. You can do this with a combination of a Microsoft account and the built‐in File History backup program in Windows. You tell the program to back up your old PC’s files, and then you tell your new PC’s program to restore the files. However, you need a portable hard drive for this to work. Portable hard drives are fairly inexpensive, usually costing less than $100. But there’s a bonus: When you’re through transferring the files, the drive works perfectly for backing up your new computer. If you’re running Windows 7 on your old PC, upgrade it to Windows 10. For many Windows 7 owners, this is probably a deal breaker. Unless, of course, you took advantage of the free Windows 10 upgrade offer that ended July 29, 2016. Now that the deadline has passed, Windows 7 owners might be better off by buying a file transfer program.If you’re running Windows 8, 8.1, or 10 on your old PC, move ahead to Step 2. If you’ve already been using File History on your old PC, jump to Step 5. Otherwise move to Step 3. Sign in with your Microsoft account on your old PC. When you sign in with a Microsoft account, Microsoft remembers many of your settings and services so it can duplicate them on other PCs you sign into. Plug the portable hard drive into your old PC and then set up File History to save your files onto the portable hard drive. When File History has finished backing up your files to the portable drive, those words change to say “Files last copied,” followed by the date and time it finished backing up your files, as shown. At that point, move to Step 5. The File History window lists the backup’s date and time. Sign into your new Windows 10 PC with the same Microsoft account you used on your old PC. Then plug the portable hard drive into your new computer. 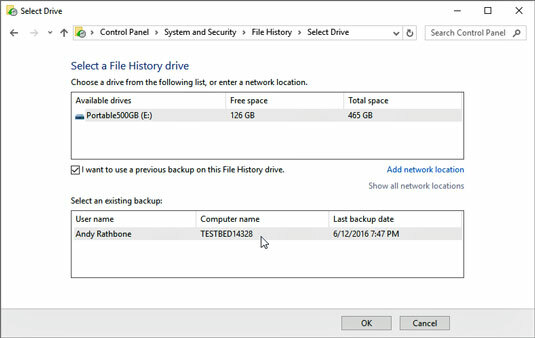 Open File History and direct your new Windows 10 PC toward your old File History backup. On your new Windows 10 PC, click the Start button and type File History into the Search box and press Enter. The Control Panel’s File History window appears, as shown. Choose the backup you’d like to restore. Click the check box labeled I Want to Use a Previous Backup on this File History Drive. A window drops down, listing the backup you’ve made on your old PC. Click its name, and click the Turn On button. Your new PC begins backing up its files for the first time, but these incoming files won’t damage your old PC’s backup. Choose Restore Personal Files from the File History window’s left pane. Choose the files and folders to restore and then click the green Restore button. Click the Forward or Back arrows next to the big green button along the window’s bottom until you find the date and time of the files you’d like to restore. For example, if you used File History on your old PC for the first time in Step 4, click the Back arrow (on the left) until you’re at the Number 1 backup. If you’ve been using File History on your old PC all along, click the Forward arrow (on the right) to move to your most recent backup. When you’re viewing the files or folders you want to restore, click the green button found on the window’s bottom edge, shown here. File History begins copying your old PC’s files and folders onto your new PC. Click the green button to restore the files and folders. If there are no complications, your new PC should soon have the files and folders from your old PC. 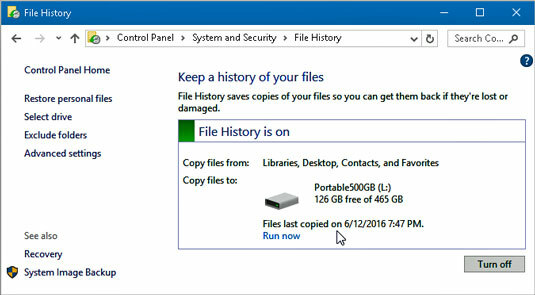 If you’d already been using File History on your old PC, all of your old PC’s backups should still be available to you on your new PC. If you’ve just borrowed a friend’s portable hard drive, you can unplug it at this point and give it back. But you should really have your own portable hard drive so you can begin backing up your new Windows 10 PC. Your Microsoft account and File History can transport your settings and files to your new PC. However, you must still install all of your old desktop programs onto your new PC. If you’re moving to Windows 10 from a Windows 8 or 8.1 PC, you can find your apps waiting for you in the Windows Store: Click your icon near the Store app’s upper‐right corner and choose My Library from the drop‐down menu. There you can find and download your old apps to your new PC.